Certain things to me are revelations, and Paul Hollywood’s fabulous homemade marzipan was one: when I was little every time my German grandmother came to visit she would bring small boxes of marzipan – she loved the stuff. Soon I began loving marzipan, too, and that was pretty much the only good thing about grandma’s visits (let’s just say she wasn’t a pleasant person to be around). Grandma Frida stopped visiting after my mom died, and then a few years later she was gone, too, and that was the end of my marzipan-flavored days. As a grown-up I began searching for that delicious marzipan, the one I ate as a kid, and to my disappointment the versions I found tasted nothing like it – they were poorly made artificial versions of the almond paste and tasted of anything but almonds. Last week, though, flipping through my newest purchase, I found a recipe for marzipan that seemed easy; since I had all the ingredients at home I gave it a go immediately, and the result was a thick, luscious marzipan, with an amazing texture and equally fantastic flavor, so good I had to hide it in my fridge otherwise I could have easily eaten a pound of it in one seating. Preheat the oven to 180°C/350°F. Line a 12-hole muffin pan (each cavity holds 1/3 cup batter) with paper cases, or generously butter the pan cavities. Beat butter and sugar in an electric mixer until thick and pale. Add the eggs, one at a time, beating well after each addition. Beat in the vanilla. Fold in the flour, almond meal and salt, then fold in the marzipan. Divide the batter among muffin holes. Scatter the berries over the top (I pushed them a little into the batter) , then bake muffins for 25-30 minutes or until golden and a skewer inserted into the center comes out clean. Cool in the pan for 5 minutes, then very gently unmold them. Transfer to a wire rack. 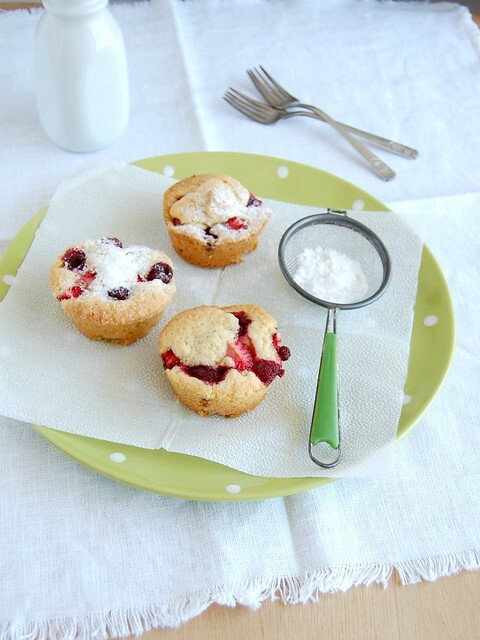 Dust the muffins with icing sugar and before serving – these muffins taste even more amazing while still warm. In a small bowl, lightly beat the egg and vanilla with a fork. In a large bowl, mix together the superfine sugar, the icing sugar and the almond meal. Add the zest and the egg mixture and combine first with a wooden spoon, then with your hands. Knead the marzipan until smooth. Form into a ball, wrap well in plastic wrap and refrigerate for at least 3 hours or overnight. Marzipan can be kept well wrapped in the refrigerator for up to 1 month. Lovely muffins, Patricia! The marzipan and berries sound perfect together! I haven`t even tried marzipan before! D: But, I love muffins so much, I`ll definitely try these! Love the homemade marzipan...the storebought is never as good as I want it to be, so the idea of making it at home sounds wonderful! Love your site and use your recipes often. I believe there is a difference between marzipan and almond paste. Marzipan is much sweeter than almond paste and it is cooked which makes it more pliable than almond paste because it's used as a covering for cakes or petit fours. I make almond paste similar to yours using very finely ground almonds, caster sugar, egg whites, and pure almond extract. I do like the idea of adding orange zest too. I always just blitz it all in the food processor. I agree it must be refrigerated overnight to develop flavour.